Having a tough week? Sometimes the degree of difficulty of a week can be gauged by the number of times it's necessary to go out and have a scoop of good ice cream. So far, in the past 7 days, this number is 2. It's interesting to consider what the adventurous flavors in ice cream do to the art of combining different ice creams together. Now, combining flavors has always been something done with ice cream, the chocolate and vanilla swirl soft serve is a classic combo. Sometimes these combinations are provided in the ice cream itself by the ice cream maker, sometimes you are left to your own creativity of combination. Does it make sense to that an ice cream with some pepper in it might go well with an ice cream based on a root vegetable from south america? Perhaps. The combination I went for last night was, to give proper credit, the suggestion of the professional on the other side of the ice cream at Tara's Organic. The combination was Pandan Ice Cream and Coconut Ice Cream. It makes sense from the perspective of food preparation. These are often used together, and not surprisingly, it was really quite a good combination. 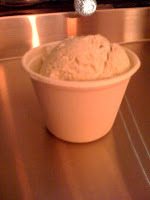 On the maker-supplied combo side of things, they have a cashew orange ice cream that's really quite interesting. You can't go wrong with the old creamsicle combo, and the cashew gives it a new twist. I might go for a scoop of this, but I tasted the molasses and that may snare me next time as well.